Millions of public Twitter streams harbor a wealth of data, and once you mine them, you can gain some valuable insights. This short and concise book offers a collection of recipes to help you extract nuggets of Twitter information using easy-to-learn Python tools. Each recipe offers a discussion of how and why the solution works, so you can quickly adapt it to fit your particular needs. 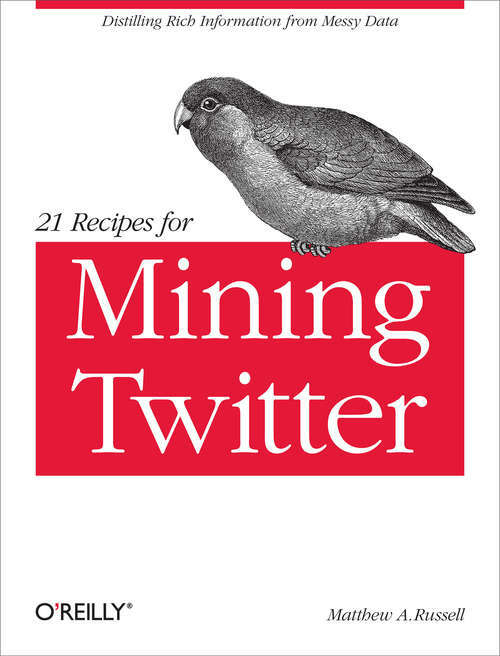 The recipes include techniques to: Use OAuth to access Twitter data Create and analyze graphs of retweet relationships Use the streaming API to harvest tweets in realtime Harvest and analyze friends and followers Discover friendship cliques Summarize webpages from short URLs This book is a perfect companion to O'Reilly's Mining the Social Web.